Received rowing scholarship from Jacksonville University. 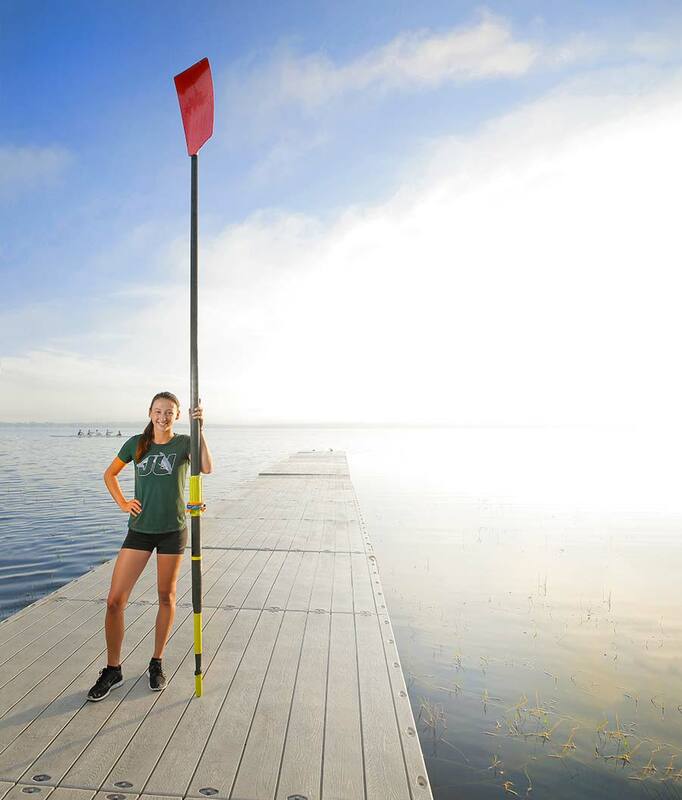 First senior from Lake County Rowing Association to receive rowing scholarship. Maintained 3.8 or higher GPA throughout high school. Played on LMHS basketball team as freshman. How do you feel about college? Nervous to be leaving and living on my own but excited to start rowing at a collegiate level. One thing about high school you won’t miss? I won’t miss the strict dress code. How did you start rowing? At sophomore orientation, Lake County Rowing had a booth set up to recruit high school students to row. My mom saw it, and the coach at the time said I would be great at it because I was tall. I ended up joining. Favorite part of rowing? My favorite thing is how unique the sport is and how competitive it can get between you and your teammates. There is a constant competition between rowers to be able to race in the top, fastest boat. Training regimen? Training and practice for rowing is intense. I’ve played many sports in my life, but I don’t think any other sport can compare to rowing. Practice was three hours a day, five days a week. In the fall, it is slower 5k races (5,000 meters); in the spring, more intense 2k races. The quantity and quality of work we do increases, and we must train ourselves to maintain high pressure throughout the 2,000-meter race. It isn’t fun, but when you see the outcome of all the work you put in, it makes everything worthwhile. Who’s your biggest influence? The first person that comes to mind is my coach, Justin Knust. If he hadn’t started coaching at LCRA, I wouldn’t be in the position that I’m in today. My 2k would not have reached below 7:35 (7 minutes, 33 seconds on the erg rowing machine), and I would not have known how fast I could really be or what I was truly capable of. Favorite food? Spaghetti (or any Italian food). Favorite music? I like to listen to almost anything; pop, country, alternative, ’80s and ’90s rock, indie, and some rap and R&B. Pet peeve? When driving, people who don’t turn right on red when it is clear to go. Another is when people are glued to their phones and excessively use them instead of having a conversation with you. Future plans? Jacksonville University has a few majors that I’m interested in: marine science, kinesiology, or photography.